"First when there's nothing but a slow glowing dream..."
Sparks will fly as the West End Premiere of Flashdance - The Musical explodes onto the stage starring Matt Willis as Nick and Victoria Hamilton-Barritt as Alex. 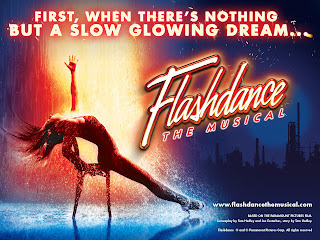 Set in Pittsburgh USA, Flashdance - The Musical tells the story of 18 year old Alex, a welder by day and ‘flashdancer’ by night, whose dream is to obtain a place at the prestigious Shipley Dance Academy. Flashdance - The Musical is full of pulsating raw energy and breathtaking choreography by Arlene Phillips (and) promises to be the theatrical event of the year! If you're a young New Yorker, you'll be forgiven for thinking the musical takes its name from one of the Big Apple's most prominent strip clubs. But it's actually based on the enormously popular, yet critically reviled, film from 1983. The musical will feature many of the songs from the movie soundtrack, including the title tune, along with 14 new songs composed by Robbie Roth and Robert Cary. What's my feeling? Well, I realize the Brits do love this kind of show. But for every Priscilla Queen Of The Desert, there seem to be two or three Dirty Dancings and We Will Rock Yous proliferating exponentially in theatre spaces all over the West End. Will this show have it all? We'll know in a flash when reviews come in after the show opens October 14. Steve, it's not just the West End that loves this kind of musical. We, stateside, love it as well: Legally Blonde, Footloose, The Addams Family, Catch Me If You Can, Dirty Rotten Scoundrels, Elf, etc etc. And hey, the Brits also gave us that gem Billy Elliot, so I'll give them the benefit of the doubt. Timothy, I'm really talking more about the truly cheesy musical adaptation of films. We haven't seen Elf or Catch Me If You Can yet, so we don't know if those will be hits or their cheesball factor. Addams Family wasn't even based on the films or the TV show. And I'd submit that while Legally Blonde and Footloose qualify, neither of them was a big hit on Broadway. In fact, Legally Blonde is doing far better business in London than it did here in the U.S.
Chris, Glad to hear you think the show is excellent. And for anyone who knows me, I'm a huge lover of London theatre. I had my tongue firmly planted in cheek.